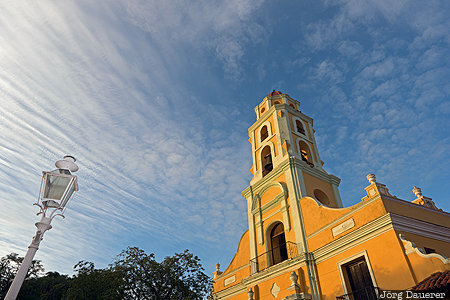 The bell tower of Convento de San Francisco de Asis with its yellow facade illuminated by warm morning light and a lone street lamp on the left which is illuminated by a flash gun ("fill flash") below a blue sky and some white clouds. Trinidad is in the province Sancti Spíritus in the south of the Caribbean island of Cuba. This photo was taken in the morning of a sunny day in March of 2016. This photo was taken with a digital camera.